Many of us are a bit mystified by the idea of a colorless, tasteless, odorless gas being a hazard to our health. Yet every year 21,000 people die from radon induced lung cancer. By comparison, 5,000 die from second hand tobacco smoke. That should be a reality check for sure! The EPA recommends we take remediative action if radon levels in our homes reach 4.0 Pci/L or higher. How many of us know what the level is in our home? Good question. Often times it’s a real estate transaction that will trigger radon testing. The advice from the EPA is that all homes should test for radon levels. One fact worth noting is that our risk of developing lung cancer goes down by half if we reduce the levels of radon in our home by half. That’s because risk is directly proportional to exposure. Given the fact that average outdoor levels are 0.3 Pci/L, there’s plenty of room for improvement in most homes. The key is to test so you know where you stand. What if you find high levels in your home? The good news is that radon mitigation systems can usually bring levels down below 2.0 Pci/L. Qualified mitigation professionals (certified) are well versed in the “how to” aspect of reducing levels successfully. A good one will be happy to give you references. There is a wide disparity of radon levels throughout the country and even in neighborhoods. So called “hot spots” are in fact true. 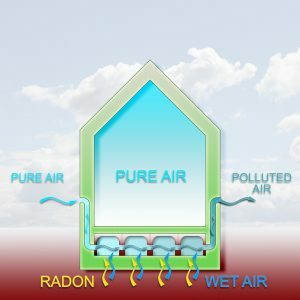 The factors that allow radon to enter a home are complicated. It is a mistake to assume that just because our neighbor has an acceptable level, then we do too. Levels can take wild swings in very short distances. The best course is to measure. Homeowners generally have two options for testing. 1)They can purchase a “do it yourself” testing kit which will be an activated carbon passive collector that needs to be sent to a lab for analysis. This will take about a week. 2)They can hire a professional measurement specialist (Florida requires these individuals to be licensed) who can use specialized equipment to give you results in two days. In either case, getting a real number is the first step to peace of mind. Our goal is to provide home and business owners the means of achieving healthy indoor environments for their families and employees. Do You Know If You Have Chrysotile Asbestos?